Steve Swett (right) stops to talk to a volunteer at the American Red Cross Bloodmobile in the IVCC gym. He has been working as a teacher for roughly 30 years, but he gets far more in depth than that. 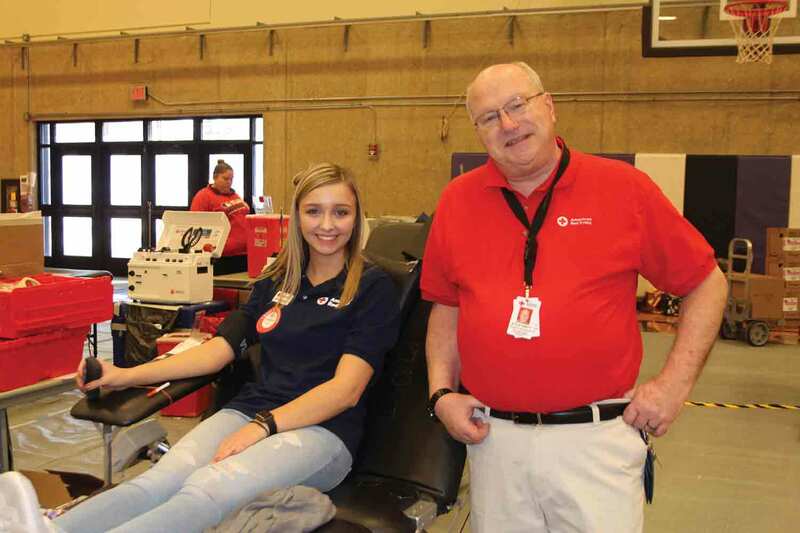 Not only has Swett been a teacher at IVCC, but he also taught at Sheridan Correctional Facility for nearly 20 years and has been a volunteer at the Red Cross for over 30 years. The moment the interview began, Swett immediately had to take a phone call in regards to the snow melting and rain that was causing flooding in Marseilles and in Utica. Even though he was dealing with these community needs and had to tend to them right after the interview, he seemed to take it all in stride. Swett replied, “Terrible,” as the man on the other line began to chuckle. Aside from his volunteer work over at the Red Cross, Swett also is involved in the charity called Sock it To The Veterans. This charity takes in sock donations and then provides veterans in need with those socks throughout the year. Frederick Becker III, who is a student in Swett’s “Preparing for college” course, said he likes the course and instructor. Swett is relatively prominent in our community and for good reason. He seems to have a knack for helping others and finds purpose in his life through this helpful hobby of his.